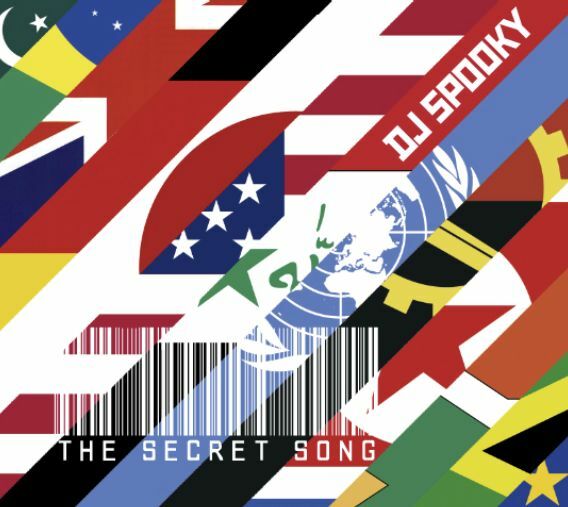 RapReviews.com Feature for August 18, 2009 - DJ Spooky's "The Secret Song"
We last heard from 'That Subliminal Kid' DJ Spooky two years ago when "Creation Rebel" was released. At the time, the reggae side of the diaspora was all that Paul D. Miller had on his mind, but such an eclectic and innovative musician can't be held down to just one genre for very long. As both a producer and a DJ, Spooky believes in music that taps into your unconscious, revealing the mood you were feeling and the thought you were thinking before you even knew you had it. He's got a thirteen year track record of doing just that, and every time one tries to define Miller's sound he redefines it for you. He's scored for Saul Williams, he's rocked it out with Sonic Youth, and he's peeled back the layers of hip-hop like an eye-watering onion with the demented Kool Keith. There's no one label that fits DJ Spooky and hopefully there never will be. 2009's "The Secret Song" is all of the above and then some. Miller denies this is even an album at all, instead preferring to state that released a musical meditation on the collision between economics and globalization in sound. That's obvious from the opening two tracks, as Spooky opens the presentation with a light and bouncy flute melody that slams into the brick wall of a movie theater, currently screening a Movietone News reel about a delicate cold war balance between countries on opposite sides. The narrator hopes the conflict will be "the challenge of ideas" instead of one fought with weapons. Boots Riley from The Coup may beg to differ though, as a DJ Spooky remix of "5 Million Ways to Kill a CEO" immediately follows. In the context though one could presume the message is that seemingly idealistic political discourse is only a function of the corporate sponsorship which holds a firm grip on every democracy worldwide. With any DJ Spooky project there are always multiple interpretations available, so feel free to draw your own. With the permission of all the artists involved, Spooky is free to re-imagine their sounds and styles as a product of borderless musical commerce, turning tracks such as Rob Swift's "Dope on Plastic" into high octane, rollicking uptempo remakes which jump from echoing organs to smashing guitar rock to old school hip-hop samples. Spooky himself calls his format on "The Secret Song" a combination of "conceptual hip hop front and center with an eerily accessible palette of material that touches on rock's relationship to dub." If that sounds heady, you've only just begun to imagine the deep waters your mind will swim in on this album. In fact Spooky claims without the least bit of wry irony that this album was made by Terminator 8 two summer blockbusters into the future. Ever wanted to hear Led Zeppelin's "Dazed and Confused" or "No Quarter" with a totally new beat, style and sound, a literal symphony of harmonious eargasm? Perhaps not, but after DJ Spooky is done with them on "The Secret Song" it's a wonder to the listener how no one ever thought of it before. It also seems patently obvious that a global and universal artform like hip-hop, one predicated on giving disenfranchised people of all walks of life a voice, would feature a song like "Azadi" where an lauded Iranian singer named Sussan Deyhim would sing to you in Farsi. It doesn't matter if you understand the words right away - just lose yourself in her beautiful voice and Spooky's head-nodding beats. Later on you can find the translation and recognize the universal theme your heart already knew was there - a desire for the spirit to roam free and unfettered by the world which we live in today. Each time you think you've got a handle on the answer to what "The Secret Song" is, DJ Spooky changes the question again, and suddenly you're pondering an esoteric rap about "Ronald Reagan's jellybeans" with a "planetary litmus test for the gentry." Say what? "That Secret Song" is best enjoyed when you stop trying to make sense of it all and just embrace the experience. The description may be making the album sound disjointed and chaotic, but in reality the tracks flow so smoothly from one idea to the next that it's only obscenely confusing if you jump around at random instead of just sinking deep into the Spooky waters that give this album its depth. Spooky is living up to his Subliminal Kid nickname here, giving you deeply encoded messages you may never see, much like the barcodes he has promised to hide around New York that will unlock bonus songs when swiped with your iPhone. (Now why can't my iTouch swipe barcodes? That's not fair.) He may be demented, he may be a genius, he may be both - but one thing DJ Spooky is and continues to be is highly creative and not boring in the least.